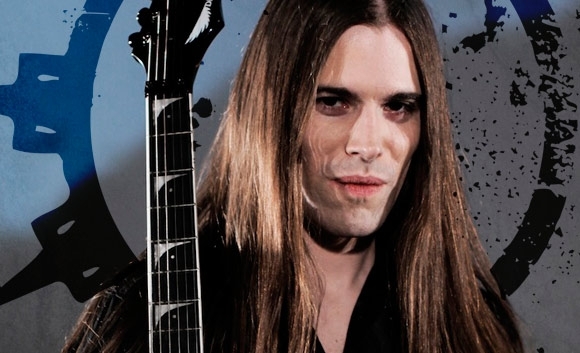 Ready to embark on their first U.S. headlining tour this August, Finnish melodic death metallers INSOMNIUM have recruited Nick Cordle (pictured; SANCTUARY, ex-ARCH ENEMY, ex-ARSIS) as the fill-in guitarist for the trek. Due to his very busy work schedule, Ville Friman is not able to join the band on this run of dates, but fans can still expect the dual face-melting, guitar hero onslaught of Vanhala and Cordle every night. Ville Friman comments: "My sincere apologies for not being able to take part in INSOMNIUM's busy touring schedule this year. I've tried my best to work my way around work and band and will be doing as many shows as possible. Unfortunately, I won't be able to take part in this run. But worry not, Nick has kindly accepted to step into my shoes and will be shredding his way into your hearts every night. In the meanwhile, I'll be concentrating on coming up with new INSOMNIUM tunes. Hope to see you soon in North America." Nick Cordle adds: "It'll be an honor and a pleasure to sit in with INSOMNIUM on this run! They're an awesome live band and I'll try to hold up my end of that 'face melting guitar hero onslaught' as promised!" Kicking off at the Heavy Montreal festival on August 9, the tour also features OMNIUM GATHERUM as direct support. Stay tuned for details about a special tour split seven-inch single with INSOMNIUM and OMNIUM GATHERUM coming soon! 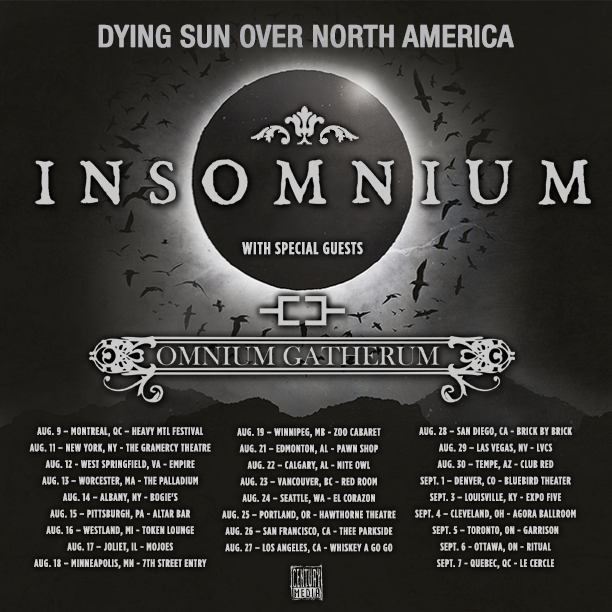 INSOMNIUM will be touring in support of its latest album, "Shadows Of The Dying Sun", which was released in April 2014 in North America via Century Media Records. All the drums were recorded at studio SF Sound with Kimmo Perkkiö while the rest of the instruments were laid down at studio Korkeakoski with Teemu Aalto. André Alvinzi of Fascination Street Studios took care of the mix, with Svante Forsbäck at Chartmakers overseeing the mastering. The artwork was once again created by Wille Naukkarinen.